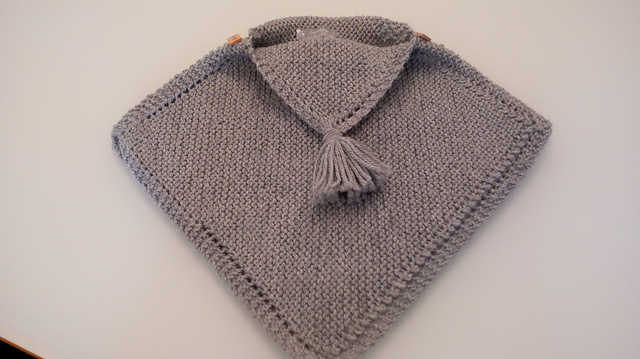 List of baby poncho knitting pattern ideas available on the Internet. Baby ponchos are great layering pieces for young kids. There are no sleeves to work through. Easy to put on and pull off. The babies have space to move their limbs around. Those with hoods can even protect the precious heads. If it is too hot, the hood can be removed and you don’t have to worry about losing them since they are attached to the poncho. This baby poncho is like a kiddy version of the little red riding hood. I think learning how to knit a hooded poncho would make me popular. 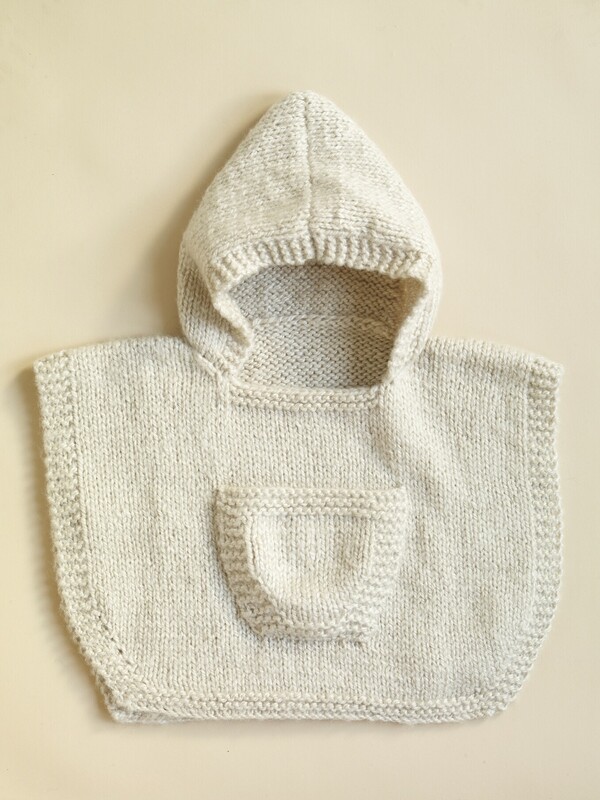 This hooded baby poncho is knitted from front to back. The neck opening is created by casting off and casting on more stitches. The hood is created by picking up stitches at the neck and the top of the hood is shaped by stitching by folding the top edge of the hood piece into half and stitch together. The little pocket in the front is so cute. Knitted from the top beginning with the hood. The hood is made up of garter stitch while the body is made up of stockinette stitch, ending with a moss stitch hem. Garnstudio’s patterns are known to need a bit more time to understand but this is one of the simpler ones. What a unique baby poncho design. Classic looking. The usual poncho is knitted in the round, this one is knitted flat. The back and front pieces are knitted separately before being sewn together. The turtleneck collar is then knitted from picking up stitches. 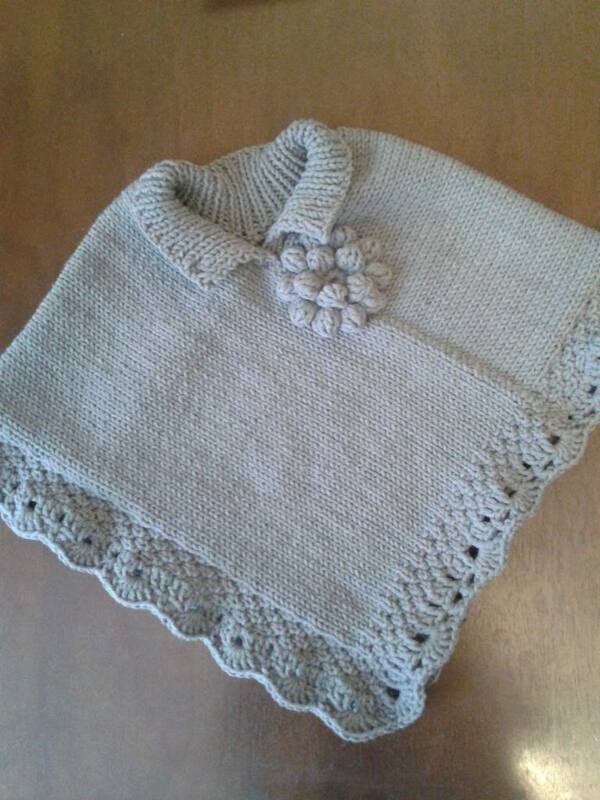 A sweet poncho with a crochet edging and a crochet flower brooch. The poncho is knitted in 2 rectangles and joined together to form the poncho. The collar is made from picking up stitches and a single ribbing. This is the first poncho I came across that is made up of 2 garter stitch squares joined together. 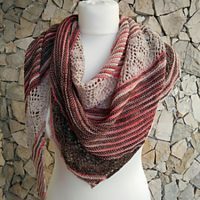 What a great idea because I like making garter stitch squares on a bias. LOL! I would consider this the best project for a beginner. Unfortunately, the pattern isn’t in English but I don’t think this is a deal breaker. You can learn how to knit a garter stitch square on a bias from my garter stitch dumpling bag pattern. Make 2 of these to a suitable size and join them together. Embellish away. 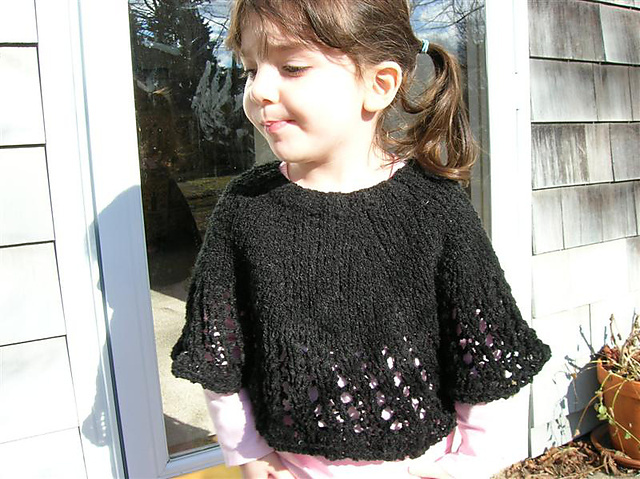 Although this pattern is titled the Kiddie capelet, it is actually more like a poncho. Knitted from the top to the bottom with yarn over eyelets. The pattern might be straightforward but I really like it. A nice idea for a spring or autumn poncho. If you like this list, you might also like my knitted baby clothes list.